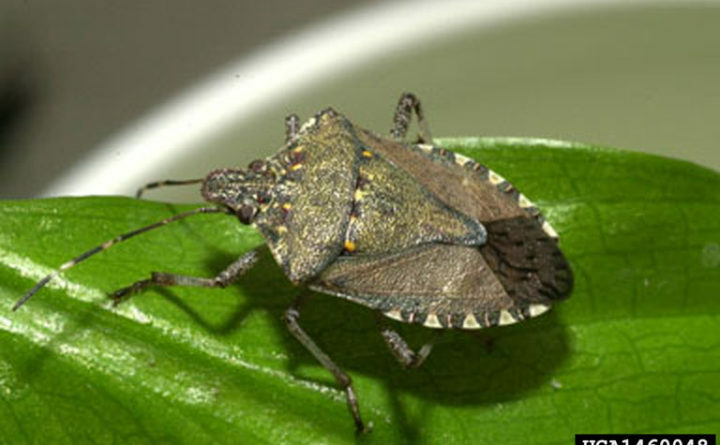 The brown marmorated stink bug is indigenous to Asia and first was found in North America in Allentown, Pennsylvania in 2001. The insects, which evidently have now settled in Maine, have been found in trees and in houses, where they produce a pungent, malodorous chemical. It can be an agricultural pest, threatening apples, pears, peaches, figs, mulberries, citrus, persimmon and soybeans. The brown marmorated stink bug, an invasive species and agricultural pest, is a fairly new resident of Maine and state officials are interested in knowing where it has been found. Watch out, Maine: Something stinky this way comes. The brown marmorated stink bug, that is. The voracious eater of fruit, vegetable and nut crops evidently has skittered and buzzed its way north to become a permanent resident of the state. 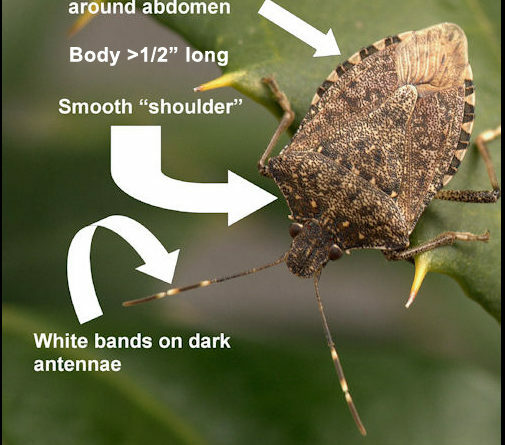 An invasive species, the stink bug was accidentally imported to North America from Asia in the late 1990s and has spread out from the Allentown, Pennsylvania, area where it originally was found. It has since been found in 44 states and four Canadian provinces, according to the National Institute of Food and Agriculture. Initially, it was thought of as just an unwelcome but transitory visitor to Maine, but a recent flurry of reports of sightings of the insect around the state has led to a change in that thinking. The brown marmorated stink bug won’t hurt you, she said. But the insects are looking for a warm spot to spend the winter, and your house might fit its needs just fine. Earlier this week, Coluzzi changed the cover photo of Maine Bug Watch, a Facebook page run by her department, to a picture of the brown marmorated stink bug and asked people to report its sightings. Just a day after making the change, more than 200 Mainers had shared the photo and 40 had commented on it. Many commenters said they had spotted the stink bug in homes stretching from Sanford to northern Aroostook County. “The brown marmorated stink bug … is so prevalent at our apartment that I figured it was just a native species I had never seen before,” one Mainer wrote on the page. The bugs are good at sneaking into homes via cracks around the windows and doors or window air conditioning units. Once inside, they can congregate almost anywhere, according to the United States Environmental Protection Agency. Look for them under beds and sofas, in cracks under or behind baseboards, window and door trim, in bookcases and in attics. They won’t damage your home, but nonetheless experts suggest homeowners take steps to keep them out. To do so, you can remove any window air conditioner units still in place, caulk windows inside and out, block holes around outdoor electrical outlets with spray foam and patch tiny slivers in the walls. You also can cap or screen your chimney, secure crawlspace entries and rake away all debris and edible vegetation from your home’s foundation to keep from attracting pests. To remove live and dead marmorated stink bugs, you can vacuum them up, though the EPA cautions that this might cause a vacuum cleaner to smell of stink bugs for a while. They release an unpleasant smell from scent glands on their abdomen when they are disturbed or squashed, the EPA says, and while they are not known to cause physical harm some people may be sensitive to allergens they give off. But they can be much worse than that to farmers and gardeners. The hungry bug has piercing, sucking mouthparts that it uses to eat crops such as apples, peaches, tomatoes, peppers and sweet corn. In fact, in 2010, an explosion of brown marmorated stink bugs in the mid-Atlantic states rampaged through farmers’ fields and caused $37 million in damage to the apple crop alone. If people spot the brown marmorated stink bugs in the state, Coluzzi said it would be helpful if they take a picture of the bug and send it to the department along with the answers to a few survey questions about where they saw it and how many bugs they have seen. “It would be helpful, so that we can determine how well established they are here,” she said. More information about the stink bug is available through the website www. stopbmsb.org, and the link to the state’s survey is at www.surveymonkey.com/r/ME2017BMSB.